On arrival of your flight or bus to Puerto Maldonado, our guides or staff will meet you at the airport or bus station and transfer you to our office to make a registration. 40 minutes to Yakari Eco Lodge. A cool welcome drink awaits you. Our first adventure will be going to the hanging high canopy bridge and zip lines. The start of the adventure circuit is reached a tower and stairway that ascends to the treetops where a platform that marks the start of the zip-line almost 200mts long, the breathtaking views are only matched by the excitement of overcoming our fears and the adrenaline that courses through us as we leap off the platform supported by the high security harnesses that connect us to the zip- line cable to a platform 27mts high. The 75mts long of the log walkway, hanging 27m above the floor, leads off this platform, a risky balancing act, and takes us to the platform at the start of the second zip line, a 160m fly back to the tower and stairwell that descends to the forest floor. able appreciate a great diversity of monkeys such as the: capuchin, tamarines y squirrel monkeys we will put on a show of swinging through the treetops charging down the trunks of the large trees that form their home in order to accept food from your hand . 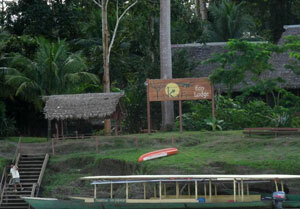 Return to Yakari Eco Lodge .Nocturnal activities are available this night we have the caiman spotting. After a great breakfast, and distributed to each traveler lunch and snacks we’ll take the boat to get to the control of Tambopata National Reserve Zone, after 1 and half hour walking trhough the rainforest we are approaching to the famous Sandoval Lake. DIts way by immense ancient trees and entangled vines; we will be able to see multihued flower and fauna including: Giant Otters, birds, coloured butterflies, turtles, and variety of fish. We will spend few hours in canoe on this one of the most beautiful lakes in region. Return to Yakari Ecolodge, dinner and rest. we take to the majestic Madre de Dios River and set course downstream for an hour for the Native Community of Ese´Ejas, the largest Ese Eja community numbering about 200 families, of which we will be visiting two. The Project “Rescuing Cultural Values“, situated on Gamitana Island, is working with two families who will show us the culture of their ancestors, their language and customs, clothing and dances. like the Ese´Eja reveals to us the customs and way of life of indigenous peoples. They gift us with the opportunity to have a direct contact with a people of ancient warriors and hunters and to share their ancestral ways. By the afternoon we have time to do roustic fishing in Madre de Dios river, where with some luck we’ll have chance to catch some species like pictus cat fish, small mouth,armored cat fish and red eye piranha. Back to the lodge, dinner an rest. Parrots and parakeets need to eat rich clay that provides them with the salts and minerals necessary to metabolize and neutralize the toxins and acids of the flowers, fruits, and seeds upon which they feed. Early each day, therefore, they congregate at the salt licks, clay walls along the rivers and streams in the Madre de Dios region of the Amazon rainforest. 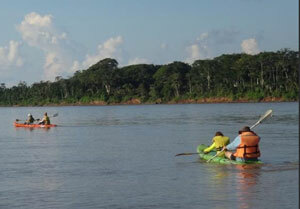 At about 7:00am we back to the lodge , have breakfast and return to Puerto Maldonado. 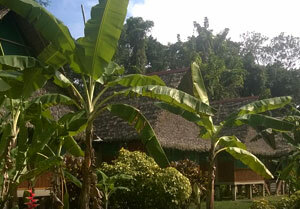 Transfer from the airport or bus station to the lodge and return to Puerto Maldonado airport or bus station. We are Muffin Group and we do awesome themes. We do what we love and this is the best in our life. Try a piece of our work and you will not want to swap for anything else!